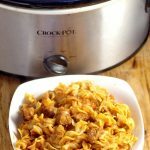 Crockpot Beef and Noodles with Tomatoes is a dinner time classic with juicy stew beef, zesty tomatoes, and comforting egg noodles, all in the slow cooker. In a bowl, toss together beef and flour until beef is fully coated. Place beef mixture in crockpot. Add all tomatoes (AND their liquids), onion, salt and pepper to the slow cooker with the beef. Stir to combine. If beef is not totally covered, add a bit of water until it is. About 30 minutes to 1 hour before serving, add noodles to the crockpot. Pour more water in so that the noodles are totally covered (probably around 4-6 cups). Stir to combine and continue cooking on low until noodles are cooked and tender.